Homer Watson is considered to be one of the founders of the Canadian landscape painting tradition. 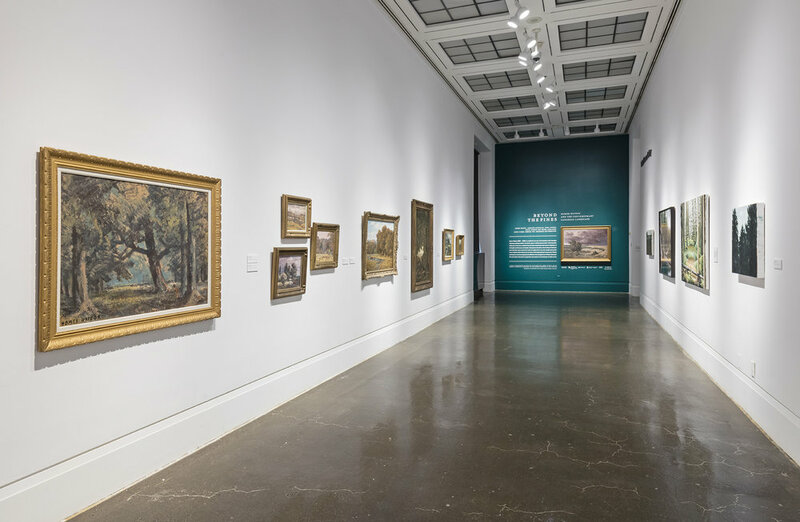 He aimed to give a ‘truthful representation’ of the Canadian wilderness in his work, as distinct from the more romanticized style found in depictions of the English and European countryside. Contemporary Canadian artists looking at landscape must also find a way to access the ‘truth’ of a subject that is not only strongly represented in our national artistic history, but one that is both deeply political and personal. Placing contemporary work by emerging and established artists alongside that of Watson illustrates the universality of the quest to appreciate and capture the landscape in which we live. Homer Watson devoted himself to painting the countryside of Doon (now Kitchener, Ontario). Combining romantic and realistic elements, his landscapes reflect Canada’s physical nature and early pioneer life. The house where he lived and worked for most of his adult life is called the Homer Watson House and Gallery. A self-taught artist, Watson was encouraged to paint at an early age by both his teacher and his aunt. He moved to Toronto in 1874, where he spent time in the Toronto Normal School and the Notman-Fraser photography studio. Travel continued to influence his work. He began to follow the Hudson River school after a trip to New York. In France, he learned from the plein air Barbizon painters. In 1907, Watson became a founding member and president of the Canadian Art Club. He served as president of the Royal Canadian Academy of Arts from 1918 to 1922. In 1880, the Marquis of Lorne, then-Governor General of Canada, purchased The Pioneer Mill, 1878, for Queen Victoria. This event launched Watson’s career. However, he considered The Flood Gate, 1900, to be his masterpiece. This painting later received a bronze medal at the Louisiana Purchase Exposition. In 1914, Watson was commissioned to paint the first Canadian Expeditionary Force at Valcartier, Quebec. He was awarded the bronze medal at London’s Colonial and Indian Exhibition, 1886. The following year, he won four prizes at Toronto’s Industrial Exhibition. Days after his death, the University of Western Ontario awarded Watson an honorary doctorate. Gavin Lynch, For Janus #1, 2014, Oil and acrylic on canvas, 127.6 x 182.9 cm, Collection of Aaron and Jennifer Postelnik. Main Gallery, Art Gallery of Mississauga. Photo by Toni Hafkenscheid. Monica Tap, A Thousand Steps, 2014, Oil on Canvas, 172.7 x 203.2 cm, Courtesy of MKG127. Main Gallery, Art Gallery of Mississauga. Photo by Toni Hafkenscheid. Gavin Lynch, For Janus #1, 2014, Oil and acrylic on canvas, 102.2 x 144.8 cm, Collection of TD Bank Group. Main Gallery, Art Gallery of Mississauga. Photo by Toni Hafkenscheid. Beyond the Pines, Robert Freeman Gallery, Art Gallery of Mississauga. Photo by Toni Hafkenscheid. Beyond the Pines, Main Gallery, Art Gallery of Mississauga. Photo by Toni Hafkenscheid. Brian Jungen and Duane Linklater, Modest Livelihood, 2012, Super 16mm transferred to HD Video (Silent) (Edition of 6), Courtesy of Catriona Jeffries Gallery. Installation View, Main Gallery, Art Gallery of Mississauga. Photo by Toni Hafkenscheid.